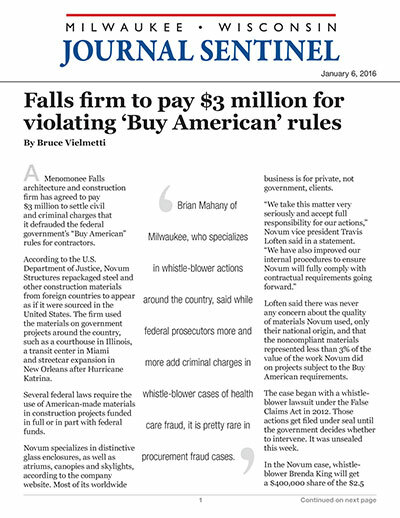 A Menomonee Falls architecture and construction firm has agreed to pay $3 million to settle civil and criminal charges that it defrauded the federal government's "Buy American" rules for contractors. According to the U.S. Department of Justice, Novum Structures repackaged steel and other construction materials from foreign countries to appear as if it were sourced in the United States. The firm used the materials on government projects around the country, such as a courthouse in Illinois, a transit center in Miami and streetcar expansion in New Orleans after Hurricane Katrina. Several federal laws require the use of American-made materials in construction projects funded in full or in part with federal funds. Novum specializes in distinctive glass enclosures, as well as atriums, canopies and skylights, according to the company website. Most of its worldwide business is for private, not government, clients. "We take this matter very seriously and accept full responsibility for our actions," Novum vice president Travis Loften said in a statement. "We have also improved our internal procedures to ensure Novum will fully comply with contractual requirements going forward." Loften said there was never any concern about the quality of materials Novum used, only their national origin, and that the noncompliant materials represented less than 3% of the value of the work Novum did on projects subject to the Buy American requirements. The case began with a whistle-blower lawsuit under the False Claims Act in 2012. Those actions get filed under seal until the government decides whether to intervene. It was unsealed this week. In the Novum case, whistle-blower Brenda King will get a $400,000 share of the $2.5 million the company agreed to pay to settle the fraud claims. It will pay an additional $500,000 in the form of a criminal fine, after the company agreed to plead guilty to concealing a material fact. In the 2012 False Claims suit, the complaint read, "Instead of providing much needed opportunities for American workers in a time of great need and high unemployment, Novum orchestrated a complex scheme designed to mislead the government and taxpayers, and deprive American workers, all while enriching themselves." King's attorney, Brian Mahany of Milwaukee, who specializes in whistle-blower actions around the country, said while federal prosecutors more and more add criminal charges in whistle-blower cases of health care fraud, it is pretty rare in procurement fraud cases. Mahany said he did not think any of the Novum structures built with the foreign materials have been found to be safety risks. King began working for Novum in 2004, according to her suit. When she brought up the fact that steel for government projects was coming from other countries without the required waiver, she was told that project managers were expected to lie about the origin of materials if asked, the suit claimed. King also said she complained to her direct boss when she was ordered in 2011 to falsify quality manuals for the Miami Intermodal Center, a project for which Novum won contracts worth more than $15 million. A year ago, a former executive at Novum was charged in state court with embezzling more than $168,000 from the company, money prosecutors said he used to buy a horse and airplane. That case is set for trial in April. A spokesman for the company said that case had no connection to the federal claims.